The Maine Beekeepers Association can help you if you have honeybees that have swarmed. We do not remove hornets nest, bumble bees, wasps or other stinging insects – just honeybees. Please be sure to identify your insects before calling or filling out this form. Once you are sure, you can fill in the form below and someone from the team will get back to you very quickly. Filling in the form on this page is the best way to get a prompt response. As part of their natural reproductive cycle, honeybees will swarm. A swarm is when a queen and a good portion of the worker population of bees leave the hive to find a new home. While a honeybee swarm is relatively harmless, it can be a frightening sight to people. Swarms should not be sprayed with water or disturbed in any other way. It is best to clear the area until a beekeeper arrives to make the removal. Our beekeepers can also offer guidance on extractions from homes, buildings, and other structures – that is a generally a service where a homeowner will need to engage a professional with carpentry skills for a fee (we can’t always do it but can almost always help you locate the right person). Please note that exterminators will not kill honeybees and often refer homeowners to find a beekeeper. Conversely, beekeepers are not exterminators and will not remove other insects. Please make sure they are honeybees and thank you for your interest in helping this important pollinator. Please fill out this form and the MSBA Swarm Team will get back to you within 4 hours (usually much sooner). We do our very best to help the public with Honey Bee Swarm Removal. Our beekeepers may be contacted in regards to removing honey bee swarms. These members beekeepers are all acting privately, as a service to the public, and are not endorsed by the MSBA. and clearly and slowly answer the same questions that you see above on this webpage – so that we can help you. *[please, do not call this number for anything except a swarm of honey bees. Please do not call this number if you have already called somebody else about this (we are delighted to be able to offer this service to help the public, but don’t want to be tripping over anybody else)]. The State of Maine also maintains a list of individual who are willing to capture swarms. 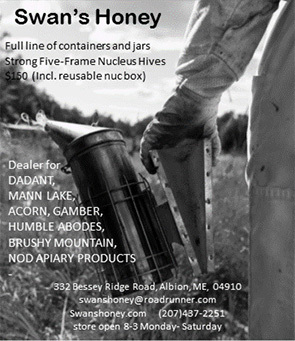 It can be found on the Maine State Apiary Program website.